Yep, this is the point where I knock it off the workbench or try to adjust that one ltiile thing, then OOPS! I started the POW. 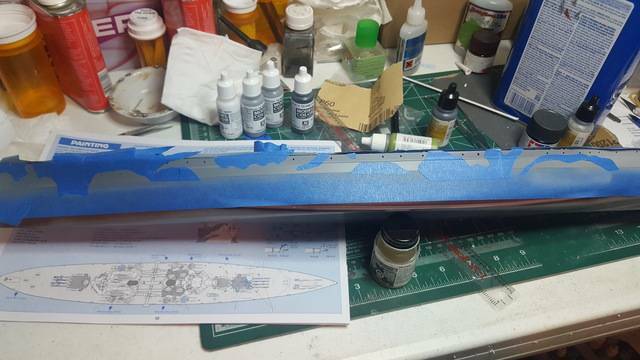 Since she will be in a waterscape I skipped the screws and rudder and went straight to the deck. The Hunter deck I purchased is very thin and has great adhesive. 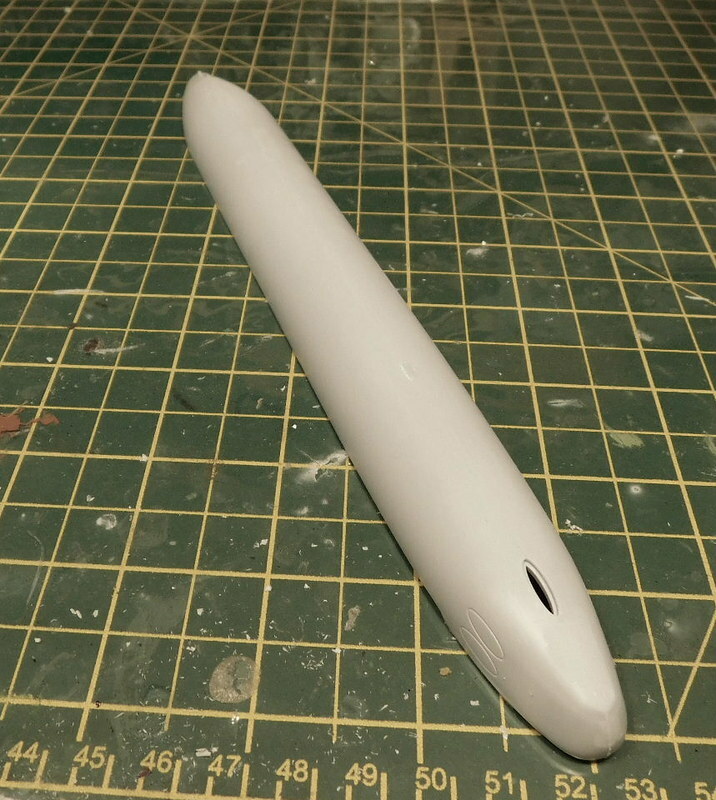 It was less expensive than other manufacturers and as far as I can tell, just as accurate and nice. I'm going to approach the painting a little differently. 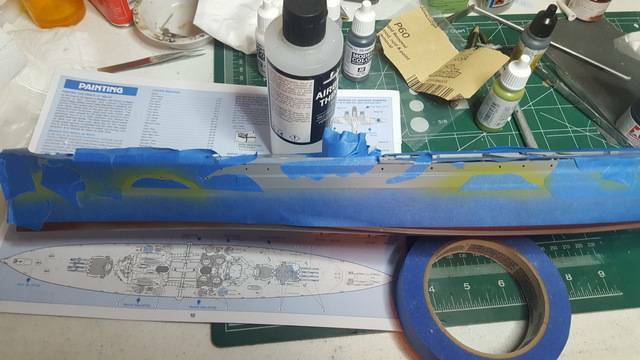 I am going to paint and partially weather the hull prior to attaching the superstructure or PE to the deck. That way it will (should) lessen the chance if breaking off the PE and fiddly bits. She got pretty beat up from England to Sigapore and I doubt the crew had much time to repaint before heading back out. Ahh, that's a much nicer look. I agree, the deck does look GREAT! Steve, did you already attach the deck, if so, did you paint the detail on the deck first? 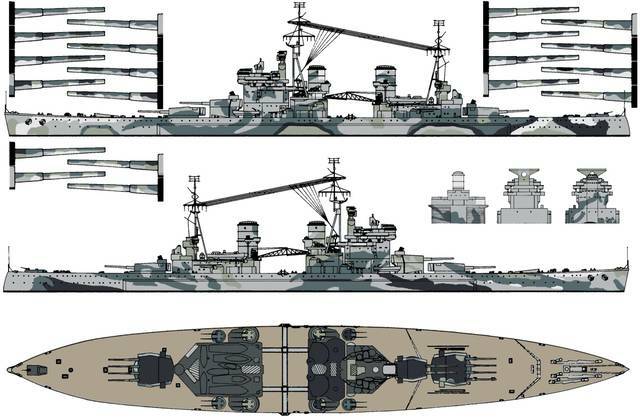 Sorry, for stupid questions, when I build my KGV, it will almost be a carbon copy of your build. I for one should look closer at what I order. 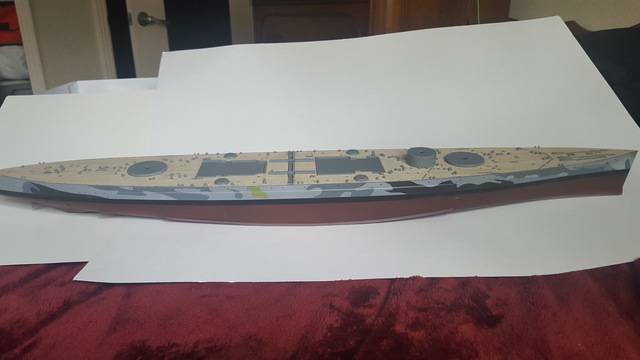 I openened my Hunter wood deck kit this morning, although it arrived over a month ago, and found out I ordered the one for a 1942 Warspite. The forward superstructure area is as different as a cat is to a dog. And of coarse, the 1915 version is out of stock with a late November expected delivery. 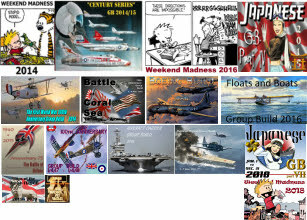 I could order a 1942 Warspite, but I'm really in the mood for something WW1 with the 100th aniversary of the armistice coming up in November. Bruce, no I didn't, but that's a good idea. I usually try to think ahead. Scott, that sounds like the POW wood deck I bought at an unbelievable price. When it arrived I realized rather quickly that it was a 1/700. 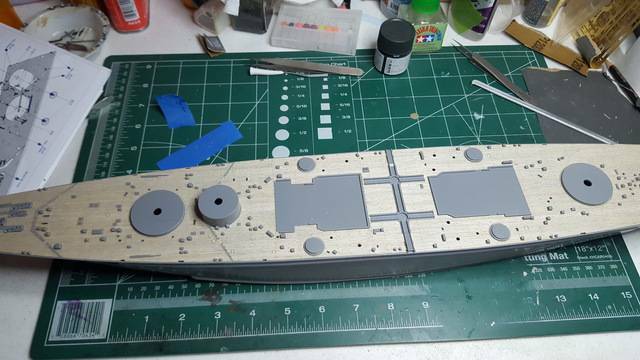 Modelcrazy> I'm not a ship-builder, but I must admit that to my eye that wooden deck looks great! Making a little progress on the crane, lifeboats and fixing the stabilizers. I added a couple cables to the crane. There should be 4 but 2 at this scale should suffice. 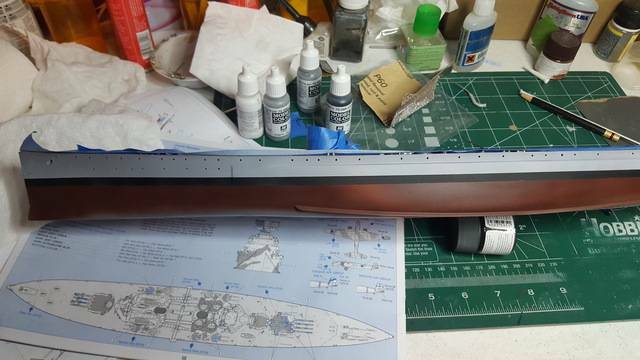 Your carrier is a very nice build, great workmanship! Nice job adding the deck. I have a couple of the Artwox ones which look nice, but good to here those Hunter decks go on well. Some more great work there Griffin. Really looking great Griffin. The crane cables look fantastic. At that scale it dosn't take much. What did you use for the cables? I really like how that ship is coming along. But, I have to admit, I think my eyes would have exploded by now working with that small of details. I'm looking forward to seeing it finished. 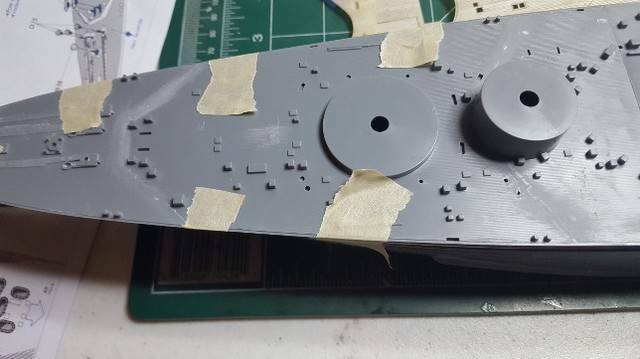 I painted the hull red, boot top black and light grey for the upper hull base. Now I'm going to work on the complex camo scheme. Bruce, I remember why I didn't add the PE and pre-paint the deck detail, I was going to mask the deck to keep overspray off and that would have pulled off or bent the PE. Steve, that makes sense. Thank you for clarifing. 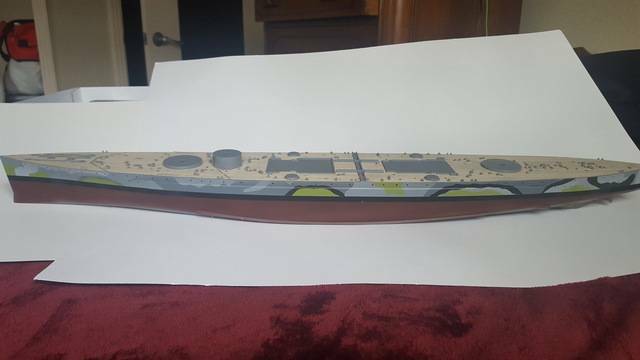 I finished the hull camo, now I'll weather it, then spray it with flat top coat to protect it. I sprayed the light gray, masked that off and added increasingly darker shades, pulled the tape off and voila! I think I got it close enough. That is looking superb Griffin. Steve, thats a cracking job, the camo is amazing. Griffin, she is looking really nice, coming together very well. After looking at that, i don't think the aircraft will be an issue. Nice work on the PE Griffin. Steve, your making camo painting look easy. Its coming along swell. The camo turned out fantastic! She's really looking good. I agree with the others, the PE looks amazing. 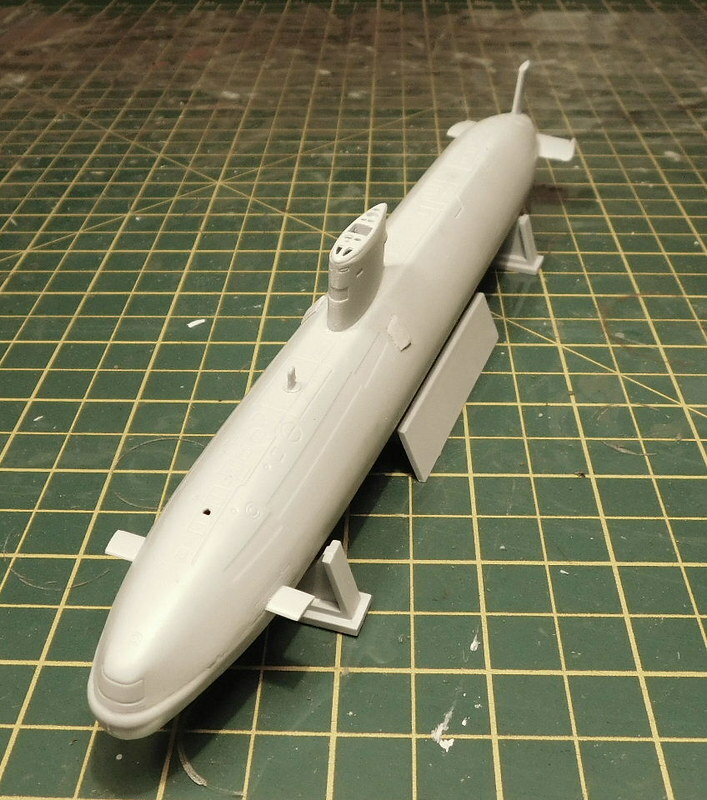 But, being it's 1/700 scale, makes it, to me, even more amazing. Great job! I promised some pics a few weeks ago, but finally here they are. This would make a nice weekend build, but i have been working on it in small doses. 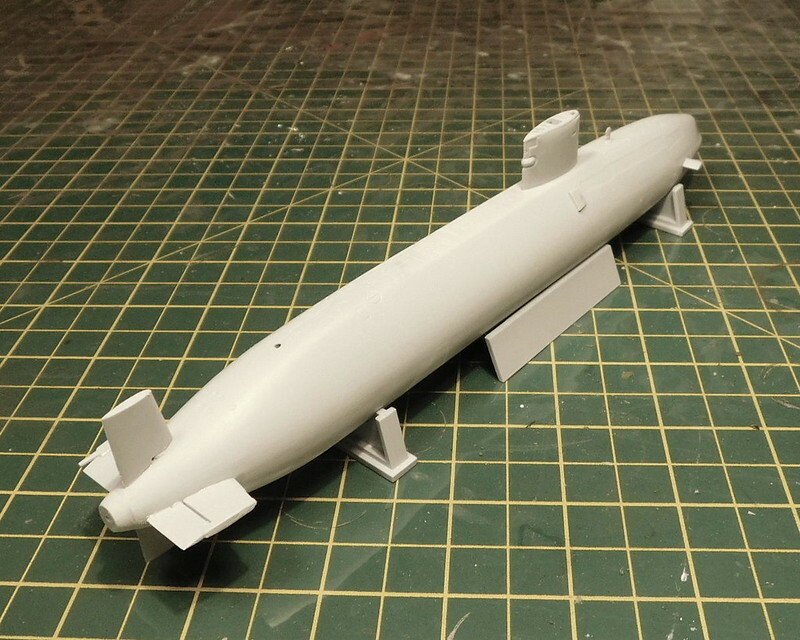 The hull is in 3 parts with the lower porion split down the middle. And then the single upper section was fitted. Then added the conning tower along with the rest of the control surfaces, excuse by lack of tech knowledge and useing aircraft terminology. Next up i will add a few of the PE parts, the WEM set is not very big anyway and i'll only use the hatches, and then to paint. 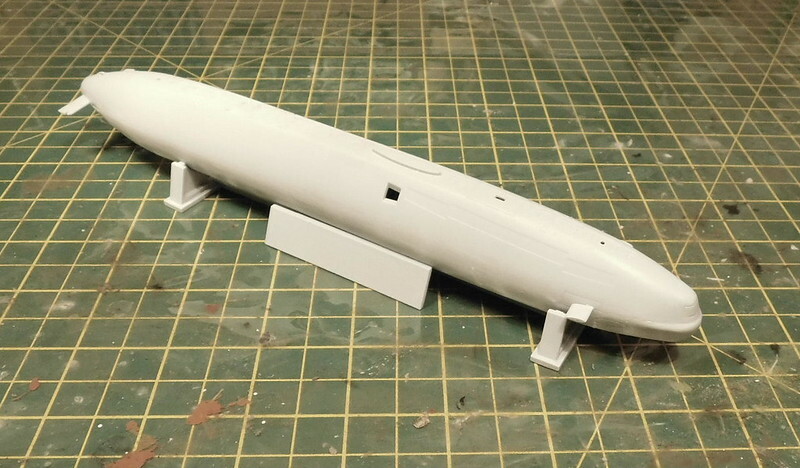 Now it looks like a sub and not one of Churchill's cigars. Control surfaces will work just fine. 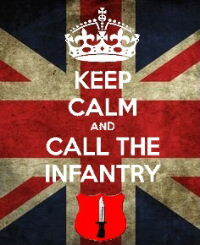 I don't know exactly what the British call them (Bonnet vs hood, torch vs flashlight etc.) but in the US we call them rudders, dive planes and screws. Cheers Steve, and i know what you mean on the looks. I would guess they call them the same in the RN, i just could not think of those terms at the time. I have an update which has good news and bad news. The good news is that I received a very nice wooden deck kit from China on Friday. 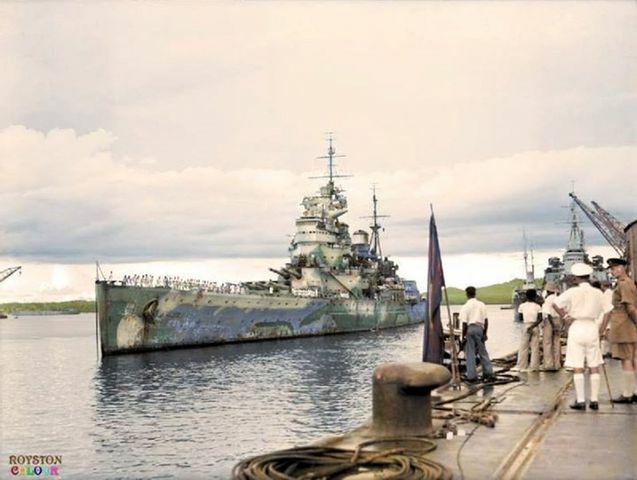 The bad news is that its for the HMS Dreadnaught and not the Warspite. 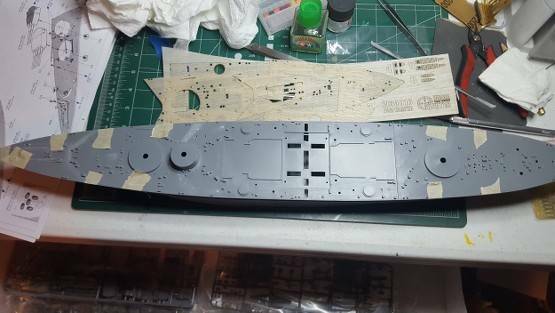 I emailed the vendor and got a very quick reply that they no longer manufacture wooden deck for Warspite and the inventory system somehow showed the Dreadnaught as a replacement part. 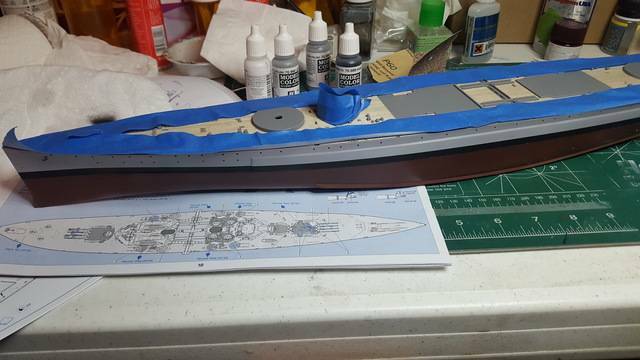 So, my solution is this, I will build the Warspite without the wooden deck and since returning the deck would be such a hassle, order me a Dreadnaught kit . Scott, this is all in my scheme to get you to build more British ships. I'm happy to see my plan is coming together BWAAA. Thanks for the props guys. I'm glad to see a few kits getting started on here. I have finished the ship portion of my Invincible. I use some ezline for..... Um I guess they are just cables, wires, ropes. IDK what they are but I see them in photos. Lines for signal flags? I used ezline for the crane cables too. I missed your question earlier Steve. I put the antennas and radar on. I also added a Union Jack of course! Now onto the aircraft and deck tractors.